Paisley is one of the most gorgeous decorative patterns humans have ever devised. It is an incredible pattern to work with because it is so full of possibilities; paisley can be done in any scale, multi-coloured, monochrome, simple, or intricate, in a regular and repeating or varied, irregular, and seemingly random pattern. This wonderful, natural design has deep, rich roots that date back to ancient Mesopotamia, the land between the Euphrates and Tigris rivers (modern-day Iran, Iraq, Kuwait, and Syria), where it found its way into building decoration, carpets, fabrics, and the decorative arts of the Babylonians, Assyrians, and Sumerians. This nature-inspired pattern, originally known as botteh or boteh in its native Persian, means "bush, shrub, a thicket, bramble, [or] herb. Some would even take it to mean a palm leaf, cluster of leaves...and flower bud," according to the Heritage Institute discussing Zoroastrianism, the ancient Persian religion and philosophy. The boteh pattern eventually travelled to India where it really dug in its heels. For hundreds of years, beautiful boteh-decorated cashmere wool shawls were popular and during the 1700s, boteh shawls cast a spell on European women who fell in love with the soft, warm, patterned fabric. British men returning home from India during the colonial period gave the shawls as gifts for their women, and the demand grew. Seeing an opportunity, the British East India Company began to export the enormously popular and expensive shawls to Europe during the later 18th century. The high cost of the boteh shawls kept many shivering, that is, until European hand weavers began to copy the boteh-patterned shawls to produce items at a fraction of the cost. In 1805, the weaving mill in Paisley, Scotland became the boteh weaving centre of Europe, and the name Paisley became synonymous with the pattern. As weaving technology evolved in the U.K., the original two-colour paisley shawls turned into five-colour patterns, though this paled in comparison to the Indian versions that boasted up to 15 colours. 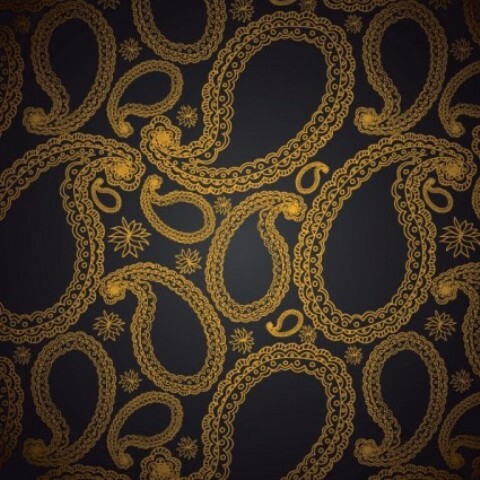 The paisley pattern can range from very simple to extremely ornate, sometimes positioned loosely among leaves, or flowers, other times simple in regular and repeating patterns. The common denominator is the tell-tale curved teardrop shapes in the design. It is the shape of the paisleys that I find particularly interesting because no one really knows what it's supposed to represent, though there are many options and theories. To the Mesopotamians, paisleys could signify halved fresh figs, mangoes, gourds, licks of flame, or Cypress trees (sacred to the Zoroastrians); kidneys, tadpoles, tear drops, pears, or sperm if you're Freudian. (During research, I came across a Jehovah Witness message board that discussed paisley as "taboo" because it is considered a representation of sperm.) 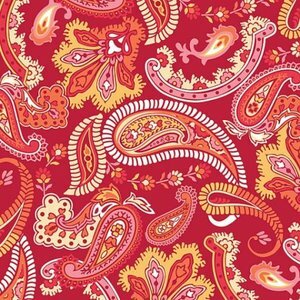 In any case, paisley seems to have originated as a fertility symbol and becomes more fantastic as it evolves. 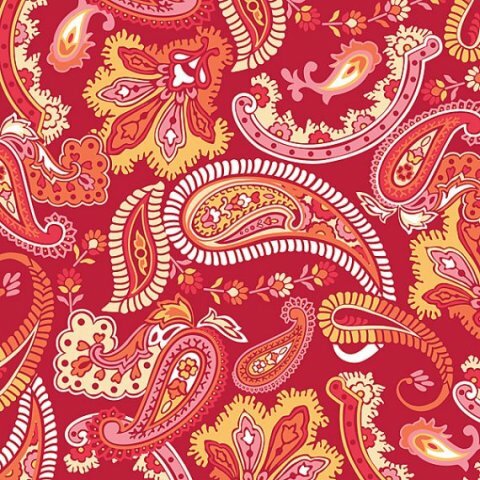 Paisley is endlessly varied in its repetition, pattern, and scale and when translated into the language of mathematics, paisley becomes the geometry of the irregular, the shapes of nature, fractals. During the 1970s, European mathematician, Benoît Mandelbrot, applied fractal geometry to computer graphics and recognized the erratic patterns of nature. In his obituary, The Guardian regards him as having "a visionary, maverick approach, harnessing computer power to develop a geometry that mirrors the complexity of the natural world, with applications in many practical fields." The concept of fractals as a self-organizing algorithm has amazing possibilities. American cyberneticist and professor of science and technology at the Rensselaer Polytechnic Institute, Ron Eglash in his fascinating TED talk, discusses the "robust algorithms" of fractals and describes seeing them in African architecture. Eglash mentions Google's use of self-organizing algorithms in their search software and predicts the rise of fractal software to enhance teaching and design tools. To see fractals in action, have a look at this 3D fractal animation video. Fractals and paisley patterns refuse to be forgotten. Though western men weren't allowed the pattern until it was introduced to menswear in the form of silk printed ties during the 1920s -1930s, paisley has certainly held on and has become a staple of men's wardrobes. 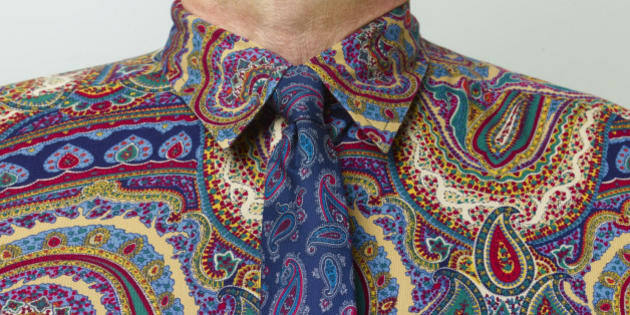 "In response to changing fashion," Francois Chaille says in The Book of Ties, "Paisley is constantly being up-dated: hundreds of new paisley motifs make their appearance on ties every year. The motif provides rich opportunities for coloristic nuance and formal invention." Of course we remember paisley worn extensively in the 1960s and revived in the '80s, but paisley has never really gone away. In fact, you may find a paisley tie in your collection, or maybe a paisley bandana or neckerchief (Cary Grant liked to wear these under his collars). If you're lucky, you may have a Ralph Lauren paisley pocket silk for your breast pocket. Stylish introverts could opt for a pair of low-key paisley socks, and the daring darlings may rock paisley Ted Baker shirts or a cool sports jacket with a chic paisley lining. 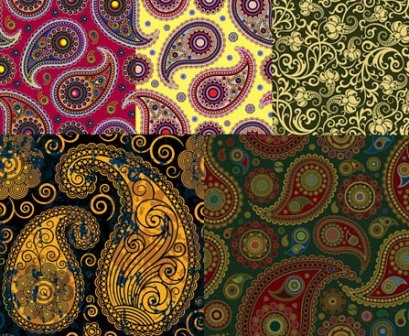 When it comes to paisley, anything goes because paisley is infinite on every level. It is a pattern that speaks of human history, elegance, and refinement; it is a delightful and permanently stylish pattern for men, and an excellent investment for any gentleman's image.